For the last 11 years, Bramble Berry has adopted a family or two through the Salvation Army to keep them in toys, clothes and food for the Holidays – this year we got 5! We love making handmade soaps and candles for the families as well as terrorizing our local shopping center for one fantastic evening. Giving back to the community is important to me and everyone at Bramble Berry. In fact, “Be Socially Responsible” is one of our five guiding principles at Bramble Berry. This year nearly all of the Brambleberrians volunteered an evening of their time to choose fabulous Christmas gifts for our adopted families. 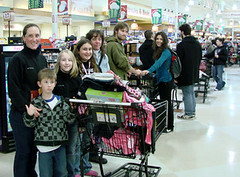 A few even brought their children to start them early on the idea of giving back. All I had to do was swipe my credit card at the end! The entire Bramble Berry gang gathered just inside the doors – a possible fire hazard – and received their assignments. This year it was extra fun due to the addition of many children. They were particularly helpful in picking out adorable baby clothes and the coolest toys. Left to my own devices, I fear that my choices for toys would be wooden, old-fashioned or book-related. We all exchanged cell phone numbers in case someone needed emergency assistance – what is an RC Hauler anyway? – and barreled into the clothing department like a herd of wild buffalo! The laughter was so loud from certain not-to-be-named employees that it was like a honing beacon if anyone got lost. Who needs cell phones when you have hilarity to guide you with? 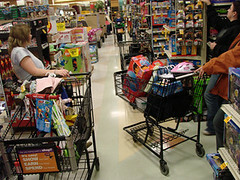 Traffic jam in the toy department. After 2 hours and much mayhem and laughter we were ready to check-out. Yes, the entire line is Bramble Berry. 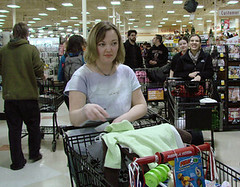 We had 11 full carts and our very own line. 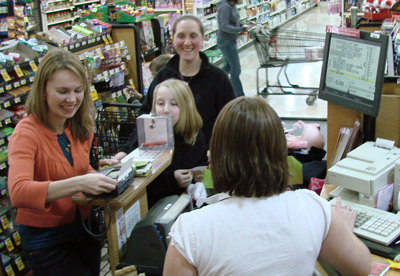 This year we had our own “experienced” cashier and check stand! She was so organized and on top of it – not a single cart set-off the door alarm as we left the store (which was good since Norm had accidentally taken the receipt with him as he exited the store). 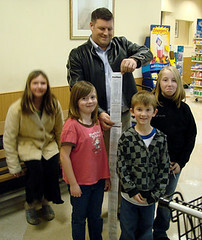 Our final receipt was taller than Chloe and Titan, two our kidlet helpers. It’s our favorite time of the year for many reasons and the Salvation Army Shopping Trip makes it much sweeter for the whole Bramble Berry team. A heartfelt thank youfor supporting us throughout the year so that we can give back and make Christmas brighter for others. Wow that sounds like you had a ton of fun and very rewarding. It’s heart-warming to know that BB “pays it forward”. Just another reason y BB is so awesome! Just another reason I love BB!! Aw, that’s awesome. I read your Social Responsibility page a long time ago and liked the way Bramble Berry conducted itself. It is nice to read this update on the holiday giving you’ve done at a time when so many companies are cutting back on charitable giving. How wonderful and I can tell my DH that my frequent BB purchases actually help a great cause (smile). Kudos to you on being so kind. This is just one more reason that I feel good ordering my supplies from you. I love this story about how both you and your employees give back to the community and help others. We have already started our kiddos on the sharing tree, as both hubby and I feel the importance of giving back. That is incredibly kind and generous. I know giving back to your community feels good. It is nice to see you and the whole time giving of your time, energy, and money to make this holiday special for some less fortunate.